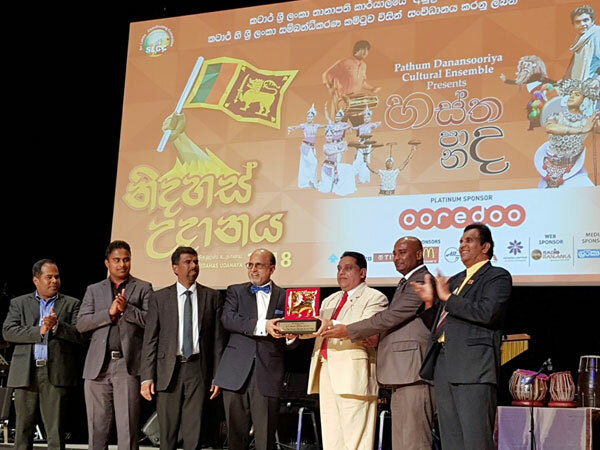 Sri Lankan Embassy in Qatar in association with Sri Lanka Coordinating Committee organized a Cultural Programme on 16th February 2018 at Qatar National Convention Centre, Doha to mark Sri Lanka’s 70th Anniversary of Independence. At this event, on behalf of the Sri Lankan Government, Mr. A.S.P. Liyanage, HE the Sri Lankan Ambassador to Qatar presented “Award of Excellence” to Dr. R. Seetharaman, Doha Bank CEO in recognition of his services. The Award was given for the support extended by Dr. R. Seetharaman for promoting bilateral trade and investment relationships between Qatar and Srilanka. Doha Bank has been extending credit lines to SriLankan banks. Doha Bank has received in-principle approval for opening representative office in Colombo, Srilanka and shall commence its operations soon. The event also witnessed cultural performances from the SriLankan community in Qatar. Mathi, General Secretary of IFL - honoured with "Annai Therasa Award"